MXR knows phasers. The Phase 90's compact size, superior construction, and refined sound put MXR on the map, and it set the standard by which all other phasers are judged. Two years later, MXR released the Phase 45 a mellower version of the effect favored for its ability to easily blend into a band's mix. Now, you can get both iconic circuits in a single pedal while tightening up your pedalboard at the same time. 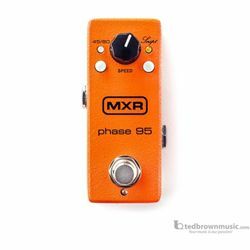 The Phase 95 combines the Phase 45 and Phase 90 circuits in a mini housing with about half the footprint of a standard MXR pedal. The 45/90 switch toggles between the Phase 45 mode's subtle two stage phasing and the Phase 90 mode's more pronounced four stage phasing, while the Script switch toggles between two phasing styles. The Phase 95 is set to modern style phasing by default, which relies on feedback to create light harmonic distortion and gives the effect a more accentuated swoosh. Engaging the Script switch removes feedback for a lusher, more subdued sound with higher headroom and greater clarity. The familiar Speed control sets the rate of the effect. The Phase 95 may be small, but it's full of rich phase tones, and it'll take a beating on the road.